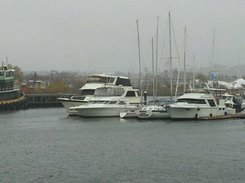 End of October, we moved Averisera from her mooring at Piers Park in East Boston to her winter berth at Admiral's Hill Marina in Chelsea. 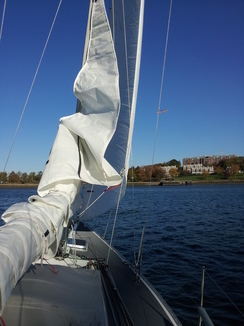 A week later, Elizabeth and I snugged the boat down for Hurricane Sandy. Norm sailed the boat around to Admiral's Hill while Elizabeth drove the truck over to the marina. Lesson's learned? No matter how short the trip, set up the main for a quick hoist. Of course, the engine stopped enroute. (Ran out of fuel twenty minutes before it would have been conveneint to have done so...) Quick like a bunny, Norm bends on the #4 and is under way again. The main takes some work to rig as it is not normally loaded on the mast track. A pair of tugs with an empty barge were coming at me from ahead. A similar set up of two tugs and a loaded cement barge were coming at me from astern. Stayed out of the way in the narrow channel of the Mystic River. Otherwise, we sailed in to our slip effortlessly. Elizabeth noted that she thought it odd not to have rigged the main before departure given the notorious behavior of Thumper the diesel. Agreed. 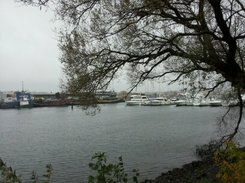 Averisera is visible as the teeny white transom next to the power yacht. The berth is secure, we believe, against the depredations of a hurricane. The heading is ENE or pretty much into the worst wind direction. The longest fetch ahead or abeam is about 200 yards. Astern, which matters only if it blows hard from the West, the fetch is about two thousand yards. In preparation for the storm, we installed a new dock cleat on the dock. The holes existed and there was evidence of a cleat having been there once. The result is that we do not share a cleat with our neighbor. Hurricane in progress. More to follow.